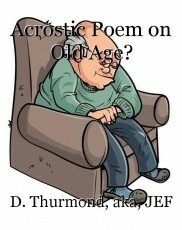 Acrostic Poem on Old Age? I detect a bit of sarcasm in this -- a shot at that stereo-typical portrayal. Made me smile, anyway. Yes, well, it's like stubbing your toe and then reluctantly laughing about it later. --- Thanks! Sorry if I gave the impression that I was offended. I was amused by your poem and tried to be funny in response. In hindsight, it didn't really work. There are indeed old folk as your poem describes, and it makes me happy to know that I am not one of them. As a matter of interest, I was born a month after Adolf became absolute dictator of Germany. But I was too young to do anything about that.